For other uses of Apollonia, see Apollonia (disambiguation). Apollonia (Greek: Ἀπολλωνία) in Cyrenaica (modern Libya) was founded by Greek colonists and became a significant commercial centre in the southern Mediterranean. It served as the harbour of Cyrene, 20 km (12 mi) to the southwest. The early foundation levels of the city of Apollonia are below sea level due to submergence in earthquakes, while the upper strata of the later Byzantine Christian periods are several meters above sea level, built on the accumulated deposits of previous periods. The existence of buildings in the sea was noted by Beechey (1827), with some rough drawings, and Goodchild (1950s) and André Laronde also published archaeological surveys of the site. In 1958 and 1959 Nicholas Flemming, then an undergraduate at Cambridge University, led teams of undergraduates trained in scuba diving and underwater surveying to map the large sector of the city beneath the sea. The results of this work were published, complete with maps and diagrams of underwater buildings in the references cited below. Carlo Beltrame and colleagues have recently made an underwater photographic survey of some of the buildings. The Crete earthquake and tsunami of 21 July 365 AD apparently caused extensive damage to the city and harbor. The Apollonia (Susa) Museum houses many artifacts found on the ancient site. Apollonia is particularly known for its ruins of three churches (out of five originally standing) dating from the Byzantine period. The Palace was last used as the Byzantine Duke's Palace and contains over 100 rooms. The previous use was as a Roman military commander's house. The well-preserved Greek theatre stands facing the sea outside the old city walls. The cavea has 28 seat levels. Recently, vandals have smeared graffiti on columns. Artifacts has also been looted. Various treasures e.g. heads or entire torsos of statues listed in guidebooks issued in 2011 are stolen. According to the head of the antiquities department of a parallel administration in charge of eastern Libya, “Many Artifacts have been smuggled abroad”. There was better site protection before 2011.“There has been a lot of destruction in recent years,” said Ismail Miftah, a farmer living next to Cyrene. Apollonia is featured as the chief port city for Cyrene in the 2017 video game Assassin's Creed Origins. Apollonia is the main site of the graphic novel ALIX - LE DIEU SAUVAGE by Jacques Martin, published originally in 1969 in Tintin magazine in Belgium. Hogarth, David George (1911). "Cyrene" . In Chisholm, Hugh (ed.). Encyclopædia Britannica. 7 (11th ed.). Cambridge University Press. pp. 704–705. ^ Michel Le Quien, Oriens christianus in quatuor Patriarchatus digestus, (Paris, 1740), vol.II, coll. 617–618. ^ a b c d Reuters (2019-02-21). "Libya's ancient ruins blighted by theft, shunned by tourists". DAWN.COM. Retrieved 2019-02-23. ^ "Libya's ancient ruins blighted by theft and destruction, shunned by tourists - Global Times". www.globaltimes.cn. Retrieved 2019-02-23. ^ "Libya's ancient ruins blighted by theft, shunned by tourists". Reuters. 2019-02-20. Retrieved 2019-02-23. Beechey, F.W. 1827. Proceedings of an Expedition to Explore the North African coast. John Murray, London. Flemming, N.C. 1959. "Underwater adventure in Apollonia". Geographical Magazine, v. 31, pp. 497–508. Flemming, N.C. 1971. Cities in the Sea. Doubleday, New York, 222 pp; New English Library, London, 222pp. Flemming, N.C. and Webb, C.O, 1986. "Tectonic and eustatic coastal changes during the last 10,000 years derived from archaeological data". Zeitschrift für Geomorphologie. December, Suppl – Bd62, p. 1 29. The ancient port of Apollonia is an archaeological treasure to be preserved. 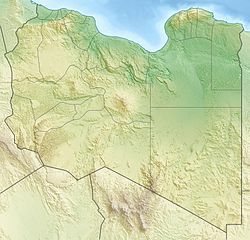 Wikimedia Commons has media related to Apollonia, Libya.